Since the release of World of Warcraft back in 2004 (don't you feel old, now? ), the MMO genre has been trapped in a funk. Numerous MMOs have risen to challenge the behemoth only to inevitably fail when players discover little more than imitations of what has already been polished and perfected. Little in the way of interesting news has emerged from the genre in years. Enter ArtCraft Entertainment and Crowfall, a radical new MMO that seeks to breathe new life into the genre and break the endless cycle of copycats. 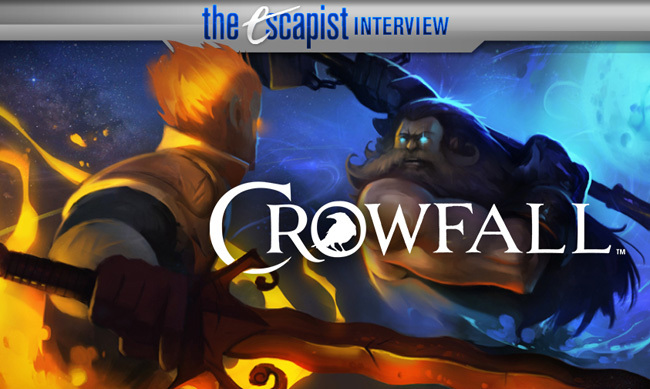 With Crowfall, ArtCraft is taking the concept of persistence and throwing it for a loop. Rather than being restricted to one class, players are essentially spirits in the form of crows, able to possess different bodies and different archetypes (classes). Though you can possess different archetypes, the skills for your character remain intact on your spiritual form. Not only is player persistence fluid, but the world is built of campaigns that have certain win conditions and actually end when those conditions are met. Campaigns can last anywhere from days to several months or longer, and each new campaign can be adjusted by the developer to account for different player strategies. The exception to this lack of persistence is an area they call the Eternal Kingdoms, home to a robust player housing system that includes large castles and modifiable terrain. There, players are able to set the rules and determine whether PvP or building destruction, using the game's voxel-based graphics, are allowed. I was lucky enough to spend an hour on Skype with ArtCraft founders J. Todd Coleman and Gordon Walton. Todd is well known for creating Shadowbane and then his work on the more youth-oriented Wizard101 and Pirate101, while Gordon served as executive producer on such titles as Ultima Online, The Sims Online, Star Wars Galaxies, and Star Wars The Old Republic. They are industry veterans with encyclopedic knowledge of the MMO genre and I wanted to take advantage of that knowledge with some higher level industry questions as well as some specific questions about Crowfall itself. The Escapist: Gordon, you gave a famous talk at GDC, "Ten Great Reasons You Don't Want To Make an MMO" and here you guys are making an MMO. J. Todd Coleman: Gordon never follows his own advice. He knows what he shouldn't do but he does it anyway. Gordon Walton: There's something to being a contrarian you know. TE: Not only are you making an MMO, which is quite a risk in itself, but you are adopting game systems that we haven't really seen before. What made you take the jump again with Crowfall? Gordon: I think that the key thing we're trying to do here is we are trying to innovate in the space and we felt like when Todd and I first got together and started talking about doing something together, we discovered pretty quickly that we have a common vision of what was going on in the business. Our assessment of what was wrong with our business was congruent. We both looked at it as super stagnant, basically WoW has sucked all the oxygen out of the room. Everybody is trying to be WoW and only WoW can be WoW. It was actually taken us backwards rather than forwards because nobody was doing anything to try to innovate in the genre. They were all basically saying, "how can we copy WoW and actually make it as big as WoW and win some of WoW's customers?" and all of those were not that successful. You want to learn from every new game and see what's worthwhile in it. but where is the new stuff? Because the customers are desperate for Innovation as long as it's not too radical. "Well the Old Republic was actually successful but that's the license. Once you have a religion for your license that's really helpful." Todd: Yeah, I think that's part of the key. It's one thing to recognize a problem, the next step beyond that is to recognize that a problem represents an opportunity. By recognizing the industry, our genre specifically, had grown very stagnant, the other kind of flip side to that is that all of the people who funded these type of games have been burned trying to recreate World of Warcraft. So they kind of took their money and went elsewhere. They all went to mobile. Now it's VR but at the time it was mobile. So that made it really interesting because the assumption from all the big players is that they felt this market wasn't cool anymore, they shouldn't play there, which left a gulf of no upcoming exciting products for the playerbase, which is still significant. It's huge. We're talking about millions of players who like this type of game. Gordon: Over 20% of the total take of games worldwide is MMOs. Todd: The numbers are huge and so major players took their money and went elsewhere. Now look at the upcoming slate of games and it's really fascinating. All the games people are excited about are coming from independent studios. You've got Camelot Unchained, us, Shroud of the Avatar, Star Citizen. They're all basically super-sized indie projects; most of them coming from developers that have experience and history doing exactly this kind of stuff and really wanted the chance to go back and revisit some of the original ideas that got snuffed out in what is kind of the burning fire of World of Warcraft (laughs). TE: This leads to my next question. Is it riskier to innovate in an MMO or is a riskier to not innovate? Gordon: I think that history shows pretty clearly that it's riskier not to. I mean how many MMO launches have we seen in the last 5 Years. where a million plus people pile in and they're mostly gone after 3 months because they go, "oh I played this game before"? They pattern match it very quickly and it's just like a shittier version of WoW with a different cover on it, with a different kind of facade. TE: Is that what happened with The Old Republic? Gordon: Well the Old Republic was actually successful but that's the license. Once you have a religion for your license that's really helpful. That's all the Star Wars is, is a religion really. Did we want it to be more successful? Absolutely. Todd: And more successful out of the gate. It really took some time for that game to get its legs under it and become successful and I think the market expectation was that it would come out and immediately take on World of Warcraft. That is a tall order. How much money is sunk just into straight-on development in WoW? Gordon: The team always thought we had a 2.5 million [subscriber] kind of game. Todd: Which is still ridiculous right? That's still huge. Gordon: But the way large companies measure themselves is beating the market leader.